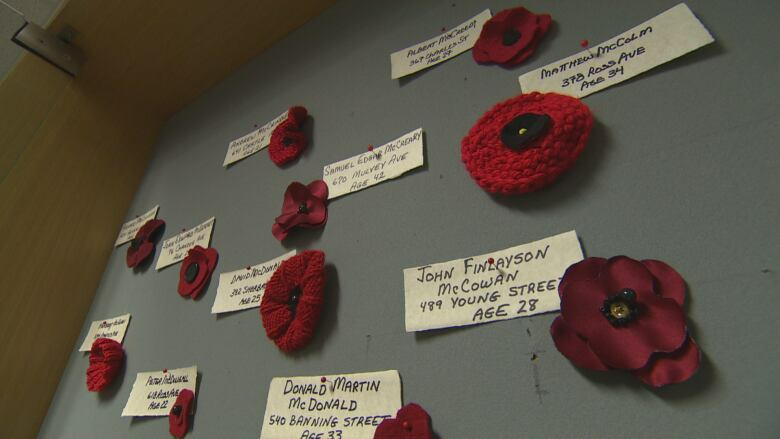 A Winnipeg artist spent more than 1,000 hours researching soldiers from the city who died in the First World War so she could honour them with handmade banners hung on lampposts outside their homes. 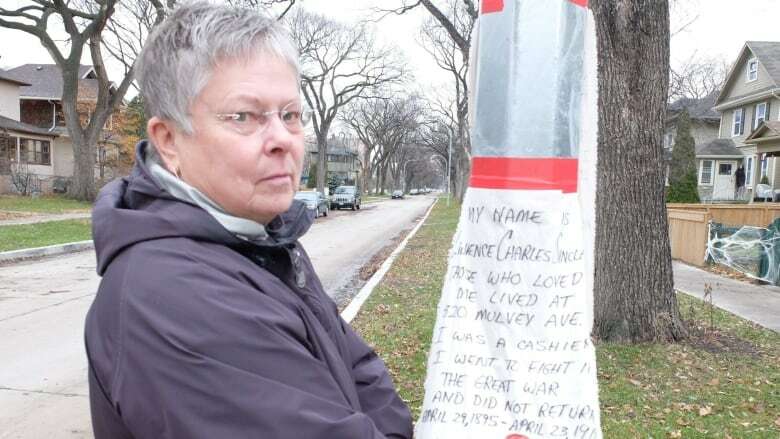 A century after Winnipeg's Lawrence Sinclair went to fight overseas, a handmade banner flaps on the lamppost outside the Mulvey Avenue home where his mother, Mary Jane Sinclair, lived. "My name is Lawrence Charles Sinclair," the handwritten text on the flannel banner reads. "I was a cashier. I went to fight in the Great War." 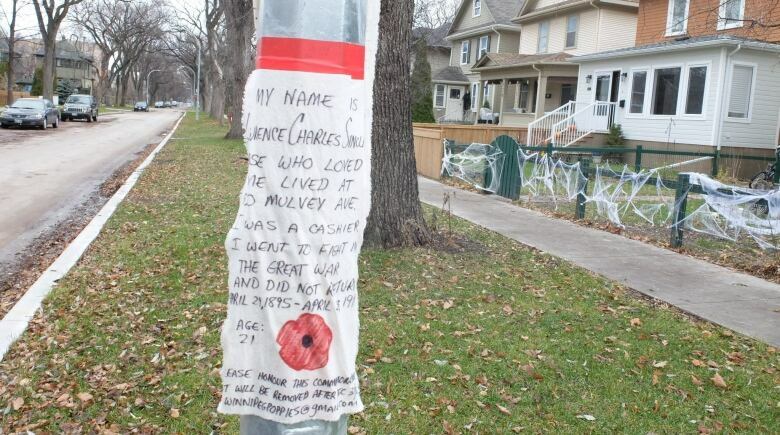 It's one of two banners hanging on the pole: the other is for James Joseph Skerry, another young man who fought in the First World War, and whose loved ones lived in the Mulvey house before Sinclair's mother moved in. There's another banner down the block, and hundreds more across the city — close to 900 in total, all crafted by Winnipeg artist Letty Lawrence and a team of volunteers, and then hung outside the family homes of the soldiers they honour. "[Remembrance Day] ceremonies are always around where the monuments are. And I wanted it to be about the communities that these people came from, and make people realize that these weren't just abstract … people from the past," Lawrence said. "They were flesh and blood, and they were just like you or me." 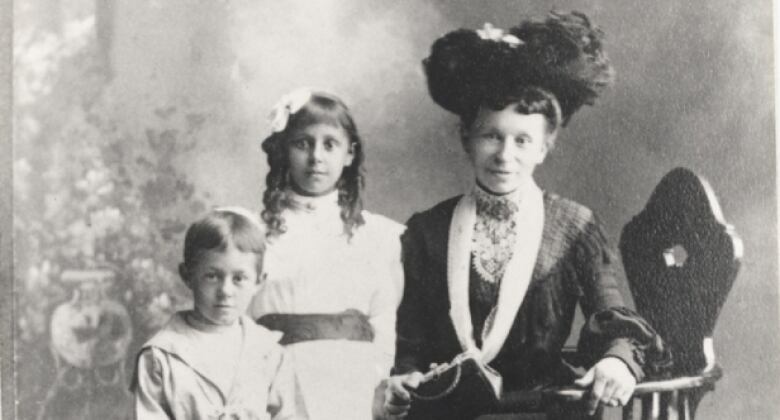 While Mary Jane Sinclair lived in the Mulvey house, she got dozens of letters from her son. In one of the early ones, a postcard sent from London, England, the young cashier from Winnipeg told her he was overwhelmed by the big city. "Don't know where I'm going but I'm on my way," wrote Sinclair, who was 20 at the time. "So much to see here that I don't know where to start." Roughly two years later, she received the final one: a letter advising her of Lawrence Sinclair's death. The chaplain who wrote that letter told Mary Jane Sinclair her son had died quickly, without pain, after being hit by a sniper on the front lines in France. "I laid his body to rest, where a cross will mark his grave, in a little old French cemetery," the chaplain wrote. "I am going to enclose a little flower I picked just by his grave." The young soldier died just a few days before his 22nd birthday. Lawrence is calling the project "Winnipeg Poppies" for short. But its full name is Loved and Were Loved, taken from the famous poem In Flanders Fields, written during the First World War by Canadian doctor and soldier Lt.-Col. John McCrae. In addition to the banners, the project includes an exhibit of handmade poppies displayed at the Blankstein Gallery in the Millennium Library until the end of the month. Lawrence was inspired by a handmade poppy exhibition she saw in Australia two years ago, which commemorated soldiers who fought in the First World War's Gallipoli Campaign. She started working on her own version shortly after. While some remembrance projects have focused on capturing the number of soldiers who died, Lawrence wanted her own to focus on the soldiers as people. 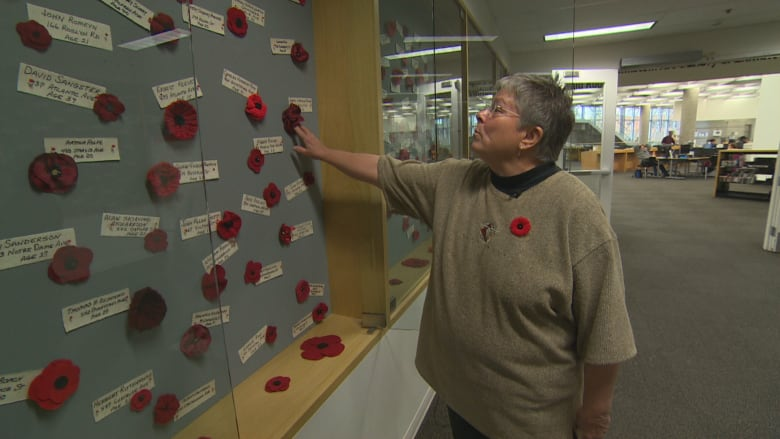 "I wanted people to think of them as what they were before they became soldiers — their professions, and as if they were family, friends and neighbours," she said. That's why she left the soldiers' ranks and military designations off the banners, she said, and why it was important to her to make each banner by hand. "I didn't want anything run off on a computer or a printer or anything that suggested, 'Well, they're all the same,'" she said. "Because I believe that the military makes them into soldiers but … I'm focusing on them as individuals." The soldiers range from teenagers as young as 16 to adults in their 40s. Most of them are in the 20s and 30s, Lawrence said. Their backgrounds range from clerks and cashiers to lawyers and railway workers. One in particular that stands out to her is Myer Lexier, who worked as a candy maker before enlisting. 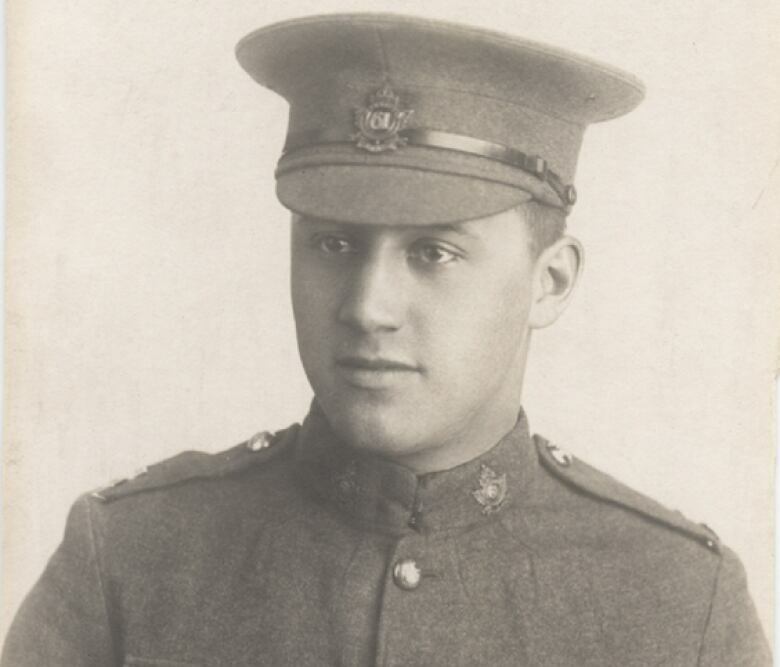 According to the Canadian Virtual War Memorial, Lexier died on April 23, 1917, at age 21 — the same day and same age as Lawrence Sinclair. The research alone took about 1,000 hours, Lawrence said. She combed through documents digitized by the National Archives of Canada, as well as records from Veterans Affairs Canada and the Canadian Great War Project for information on each soldier. She then set out crafting the memorials on cotton flannel — which she chose because it's the same material many of the soldiers' undershirts were made of. She paid for the project out of her own pocket, and had to take money out of her savings account to fund it. Lawrence said it will likely be a one-time project for her. Now retired, she's got more ideas for future fibre-art projects she wants to begin work on. The banners include a note at the bottom, asking people not to remove them until December, when Lawrence plans to take them down herself. After that, the plan is to donate them to the ANAVETS (Army, Navy and Air Force Veterans) Rockwood Unit No. 303 on Wilton Street. One family has already asked to keep the banner posted outside their home, she added, and have it framed. After that, they proposed the banner could stay with the house, Lawrence said, and become part of its history. Lawrence hopes the banners live on to memorialize the soldiers who died. "These are individuals who were loved by family members, friends, neighbours," she said. "And in turn, they loved as well."